Published July 2, 2018 at 2:56 a.m.
Alternative-rock sensations The Neighbourhood took to the Uline Warehouse for night five of Summerfest. Although the show lasted what seemed to be a quick 60 minutes, in that short timeframe, the band hit nearly every one of its big songs and the interaction was decent. Reaching the stage at almost exactly 10 p.m., The Neighbourhood wasted no time jumping through the thick smoke filling the stage and into the music on a warm, but not-too-hot summer night – which, unlike earlier in the day, was dry. Formed in 2011 in California, the band includes Jesse Rutherford on lead vocals, Zachary Abels on lead guitar, Jeremiah Freedman on rhythm guitar, Michael Margott on bass guitar and Brandon Fried on drums. The Neighbourhood's rise to fame was quick following its formation with the release of their debut album titled "I Love You." Released in 2013, "I Love You" featured The Neighbourhood's first major single: "Sweater Weather," a song that climbed its way to the top of the Billboard alternative charts and remained there for 11 non-consecutive weeks. Reaching stardom in just two years, The Neighbourhood has been putting out music steadily ever since – including its latest self-titled album, which was released in early 2018. 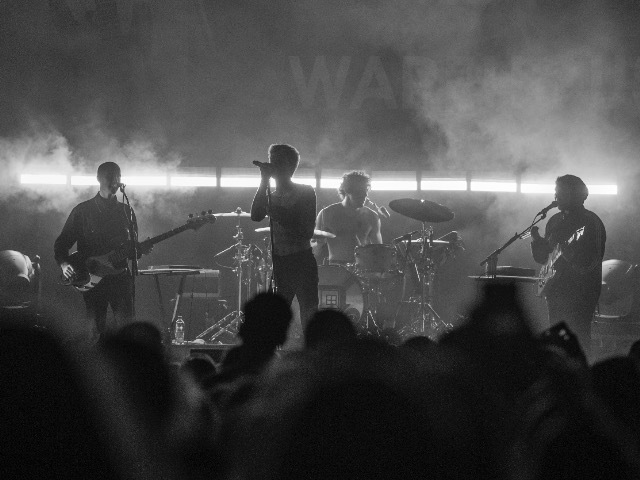 Known for its mix of alternative, rock, pop and hip-hop, The Neighbourhood delivers a sound that is truly unique – and the band's Summerfest show was a perfect showcase of just that. The Uline Warehouse stage was, for the most part, full. There was still plenty of standing room, but nearly all the bleachers with filled with screaming fans who seemed to know every word to every song played. The audience was very high energy and clearly came to see a show filled with their favorites – and The Neighbourhood delivered. In fact, there were no long breaks in between any songs as it seemed the band knew what the audience came for and they were prepared to deliver. It wasn't until halfway through the set that the band took about two minutes to drink some water and recompose. However, after that, they just let the music keep rolling – including songs from all three of their albums. Songs such as "R.I.P. 2 My Youth," "Cry Baby" and "Daddy Issues" all came off the band's 2015 album, "Wiped Out!" From the first album, the band played "Afraid" and, of course, "Sweater Weather," while "Void" was a notable song played off the latest album. While rocking the smoky Uline stage, The Neighbourhood certainly had the presence of a modern alternative band. 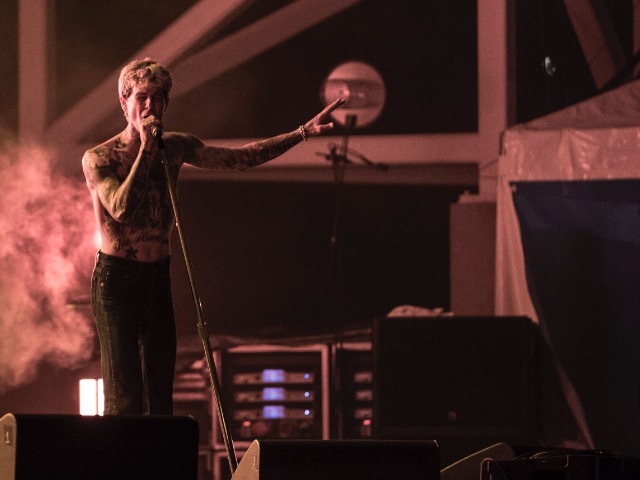 In fact, much like Summerfest night one artist Lil Uzi Vert, The Neighbourhood's lead vocalist Jesse Rutherford is known for dancing around the stage and singing with his shirt off as well – although Rutherford does not dance around with the energy Lil Uzi Vert does since The Neighbourhood's songs tend to be a little more on the mellow side. Admittedly, the interaction was on the low side from the band and Rutherford specifically. However, the few times he did speak to the crowd, it was clear that what he was saying was genuine. From screaming that he loves Milwaukee to telling the crowd how happy they are to be back in this city and saying they love Summerfest, it was clear The Neighbourhood was having a good time. The 60-minute timeframe seemed to go fast due to the non-stop set. It seemed like the band could have taken its time and spoken with the crowd more or slowed down the pace to make the show last a little longer and give their fans more time to bask in their glory, but they never did. Due to the short, speedy set, everyone in attendance thought there would be some sort of encore – even if it was just one song. But once Rutherford said, "Goodnight Milwaukee," and walked off stage around 11 p.m., that was all they had to give. While it was fast, it was still clear that delivering a good show was The Neighbourhood's top priority. And it was also clear that they were having fun doing just that while feeding off the energy of the crowd. Smiling and appearing to be very happy is not necessarily The Neighbourhood's style, as their music can sometimes have a darker vibe to it. However, there were times when the band members, specifically Rutherford, could not help but smile and sometimes point out into the screaming crowd. Other than its fast-paced set, another mild but still odd part of the show worth noting was that Rutherford would sometimes sing with his back faced to the crowd. In fact, he would face away from the crowd for somewhat long periods of time. Whether it was to show off his back tattoos or to watch his bandmates during the performance will never be known, but even so, it was clear Rutherford was enjoying the show. Still if every fan in attendance at the Uline Warehouse had a checklist of what songs they wanted to see out of The Neighbourhood, no matter what was on that list, it would have definitely been crossed off. There was not a single person in sight who was not either screaming at the top of their lungs or singing along to every lyric. So, although it was swift, The Neighbourhood still rocked Summerfest.